Add GS1-128 barcodes to OpenOffice without installing special fonts. 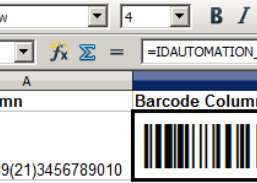 FromIDAutomation:The Code-128 & GS1-128 Native OpenOffice Barcode Generator is a VB Macro that may be easily inserted into a Calc and Writer to create barcode images. Once installed, no other components or fonts need to be installed to create barcodes. The macro provides formulas, that when displayed in a spreadsheet or document, create an Apache OpenOffice barcode from an already installed system font.